As Archbishop Edwin F. O’Brien toured three Catholic Charities’ programs that care for children with severe emotional disturbances and developmentally disabled adults Jan. 16, he was thunderstruck by the motto “Cherish the Divine Within” written in one of the Timonium buildings. developmentally disabled adults in these facilities illustrates their dedication, he said. The prelate began his morning at the Villa Maria Residential Treatment Center that serves children 5 to 14 with severe emotional disturbances. His guide was a 9-year-old client named Briana who is preparing to leave the facility where she received intensive therapy and learned social coping skills. At the St. Vincent Center – another residential treatment center for children 13 and younger with serious behavioral and psychiatric problems – he had a chance to observe the recent renovations to the former orphanage that now provides each child with their own bedroom. From the time the youngsters arrive at St. Vincent’s, the staff is working for their discharge, and 85 percent of them transition into a family-type home, either through adoption, a stable foster home or returning to their natural parents when appropriate, Ms. Rode said. 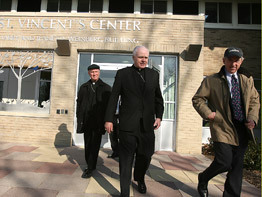 While touring Gallagher Services – a residential and day program for individuals with developmental disabilities – Archbishop O’Brien watched some of the clients dancing to music and explored one of the apartments that houses eight women, which is staffed with healthcare professionals and outfitted to accommodate their wheelchairs. “About half of our clients don’t have any family involvement,” said Mark Shulz, lifetime services division director of Gallagher Services. “You are their family,” Archbishop O’Brien replied.